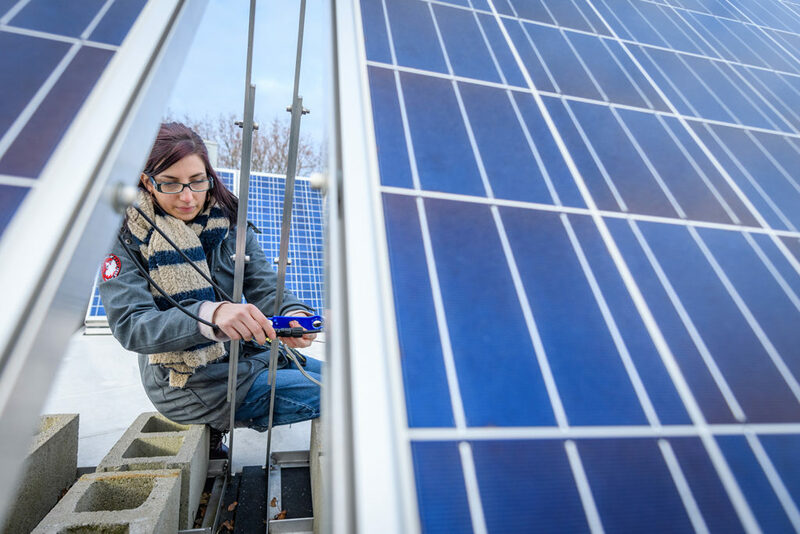 Megan McIntyre ’19 works on a solar panel atop the Biophysics Building at Clark. The solar panels will be used for a cell phone-charging station in the campus’ Bistro; they’re also used for research projects in the Physics Department. As a first-generation student unfamiliar with the college application process, Megan McIntyre ’19 picked a safe bet for her first year: a state university in her home state of Oregon. Headed toward a major in sociology with a focus on crime and law, McIntyre fell in love with physics after taking a class called Physics of Energy and Renewable Technology. But the Beaverton, Oregon, resident wasn’t in love with a big state school, and so she asked her physics professor where she might transfer. 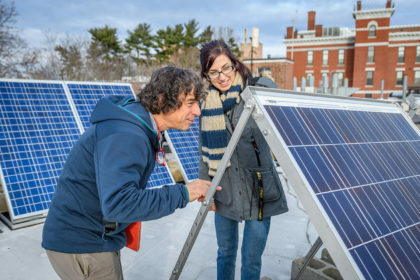 Megan McIntyre and Physics Professor Chuck Agosta check out the solar panels. Now in her senior year, McIntyre has found her niche as a physics major and mathematics minor, working closely with Charles Agosta, professor of physics, on renewable energy research and as a teaching assistant for an astronomy class. She’s finishing a hands-on research project with Agosta that will use energy captured from solar panels atop the Biophysics Building to power a cell-phone charging station in the University’s Bistro cafe. She also has worked on a directed-study project in Agosta’s microgrid lab, where she taught herself back-end programming languages to code a user-friendly website. The site displays the power produced by the campus’ microgrid; tracks wind turbines, and also the solar panels used for the Bistro and for research purposes; and provides campus weather data. Outside of her physics research, McIntyre works as a paralegal for a law firm in Worcester, serves as vice president of Clark Women in STEM, and has been helping the Undergraduate Student Council on a project to renovate the Grind, a student social/entertainment space in the basement of Higgins University Center. Professor Agosta and Megan McIntyre check out the instruments involved in producing and measuring renewable energy at Clark. Her sophomore and junior years, she ran for the women’s cross-country team and served as treasurer of the Student Council. Working for Clark Orientation, she served as a peer adviser for incoming students and then as an orientation coordinator for transfer students, commuters, and incoming first-year students involved with the ACE Summer Institute and Connections programs. After Clark, McIntyre hopes to work in the field of renewable energy technology and eventually secure a doctorate in physics. She also harbors an interest in working for the FBI; in high school, she attended an FBI National Academy Associates Youth Leadership Program, later serving as a peer mentor in the program. “If someone were to ask what drives me, I would say helping people,” McIntyre says. As for her decision to transfer to Clark, McIntyre strikes a philosophical note. “Things seem to happen for a reason in my life” she says. “Why did two different people, clear across the country, tell me about Clark, a school in the state of Massachusetts, which is also full of plenty of other colleges and universities where I could have applied?